Jainism has been flourishing in India since its inception. Over a period of time, it has become one of the major religions in the world. Each and every state of India has certain shreds of evidence related to Jainism, its followers and preachers. Madhya Pradesh is one amongst these places, where you can find several ancient buildings and historical monuments made in reference to Jainism and in loving memory of their gurus, tirthankaras. 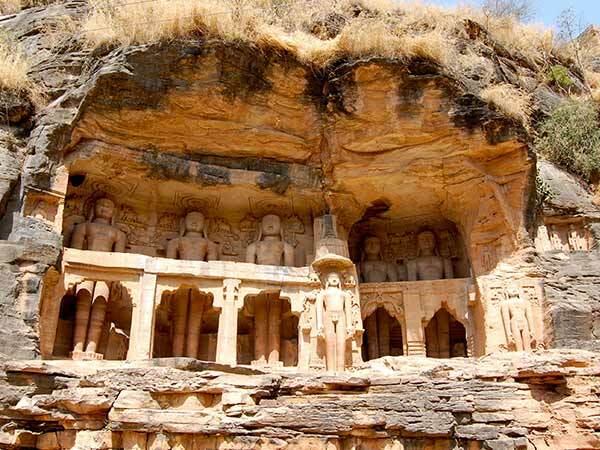 Siddhachal Caves is one of these ancient monuments in Madhya Pradesh which depict the life and evolution of Jain gurus. Apart from its cultural significance, the beauty of its architectural work is praised as well, by historians and tourists. Once you are within the complex of Siddhachal Caves, you will certainly be awestruck after witnessing its grandeur. Located in Gwalior in the state of Madhya Pradesh, the region in and around Siddhachal Caves experiences an extreme type of climate. Even though the historians and ardent globetrotters travel irrespective of weather conditions, it is still advisable to avoid visiting Gwalior during the summer season as the temperature rises above average level. If you are looking to explore the caves as a tourist, then the best time to visit Siddhachal Caves is from November until the end of March. Built by Tomaras of Gwalior, Siddhachal Caves are Jain monuments which date back between the 7th century and the 15th century. Siddhachal Caves are located within the boundaries of the majestic Gwalior Fort atop a rocky hill and hence, it remains a significant tourist destination in Gwalior throughout the year. Even though there are several monuments and statues which have been destructed during the attack of Babur from Mughal dynasty, you can still find its beauty in pure and intact form. From statues of all 24 Jain tirthankaras to several reliefs narrating the Jain legends and age-old caves to intricate patterns, you can find everything related to Jainism since its inception till its popularity across the globe. The beauty of Siddhachal Caves lies in their structural formation of monumental statues and the depiction of Jain legends through several reliefs, which are created flawlessly on the rocks. Even though the destroyed monuments and statues seem incomplete in terms of their formation, the beauty of these structures is still unfathomable. The colossi of Jain tirthankaras are the centre of attraction at Siddhachal Caves. These larger than life statues are something which should not be missed by anyone. Considering the period in which they were made, this grand creation is definitely a wonder in itself. You must visit Siddhachal Caves if you are an architecture enthusiast and love exploring the fine work of artistry. One cannot merely miss such impeccable instances of architecture as there is a lot in its compound to discover and explore. Who would not love to witness the beauty of larger-than-life statues of Jain tirthankaras? Apart from Siddhachal Caves, you can also enjoy several beautiful palaces and other ancient monuments which are built inside the complex of Gwalior Fort. The way these caves and marvellous statues are cut out of rock faces is certainly commendable. So, why not visit these wonderful cave monuments? By Air: You can take a direct flight to Gwalior Airport. Once you have reached the airport, you can hire a cab to Siddhachal Caves. By Rail: Gwalior is well connected to major cities and towns by rail. Hence, you can catch a direct train to Gwalior Junction. By Road: Located at a distance of around 340 km from Delhi and around 120 km from Agra, Siddhachal Caves are easily accessible by road.